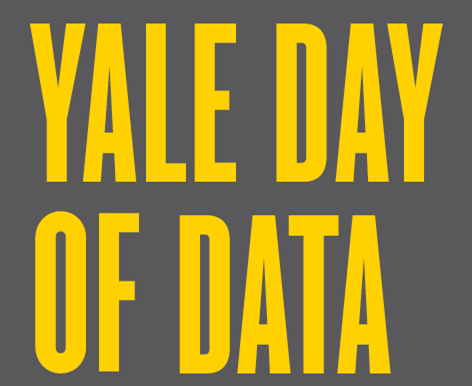 Yale University undergraduates, graduate students, postdoctoral researchers, faculty, and staff are invited to submit posters for the 2018 Yale Day of Data poster session, to be held on November 29. The deadline to submit a poster is November 1. Whether your research data consists of interviews from field work in South African tuberculosis clinics, to collections of French poems or mass-scale genomic data, we welcome your submission. Submissions will be evaluated on the extent to which they communicate research to a general university audience and emphasize the role of research data in your work. Quickly communicating your research is hard. Communicating it a general audience outside your specialization is even harder. This event gives you an opportunity to hone those skills. In particular, it’s a great opportunity for graduate students before they head to conferences. Don’t have a poster ready? Submissions received by November 1 that are accepted will be printed without any charge to the submitters. However, the acceptance process is competitive. Attendees of the poster session will be able to vote for the presenter and poster that best emphasize communication to a general audience and the role of research data in their work. The winning presenter will receive reimbursement for printing costs to present a poster at an upcoming conference or event. Complete details on the process and event are at https://elischolar.library.yale.edu/dayofdata/2018/posters/. Questions about the poster session can be sent to Barbara Esty (barbara.esty@yale.edu).